Wow, what amazing weather we are having. 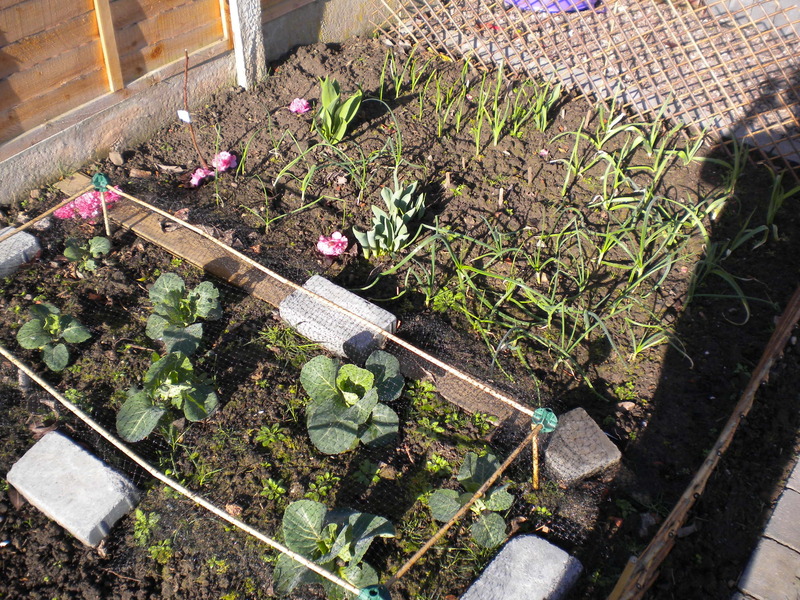 I’ve taken advantage by having a good tidy up of the veg patch and got rid of as many weeds as I can. Unfortunately there is bindweed popping up around the edge and the tulips have firmly established amongst the onions! 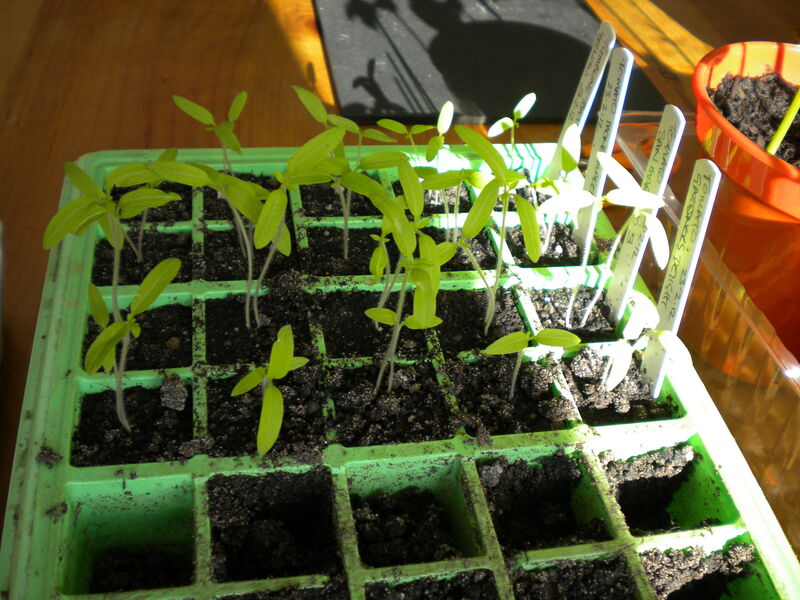 In my beginner’s eagerness I thought the tomato and bean seedlings on my kitchen table would like a bit of sunshine and put them outside during the day on Saturday & Sunday. But they have gone all pale and some of the leaves have wilted. I’m thinking that although it was supposedly something like 20 degrees out there, that there was a cool breeze that they didn’t like. I’m hoping they will recover otherwise it’s back to square one! Lesson learned: don’t be too keen!!! 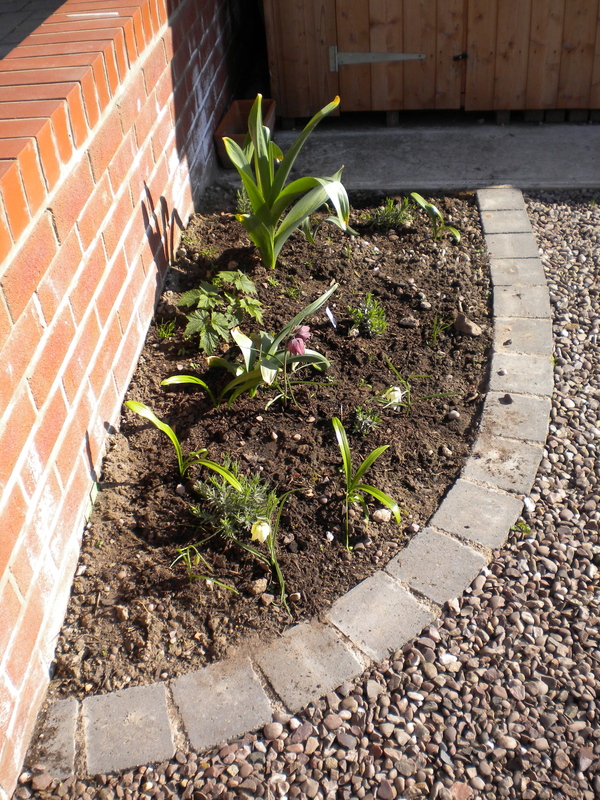 ….into which I put my free* lavenders, a Japanese Anemone, and some bulbs in the autumn. 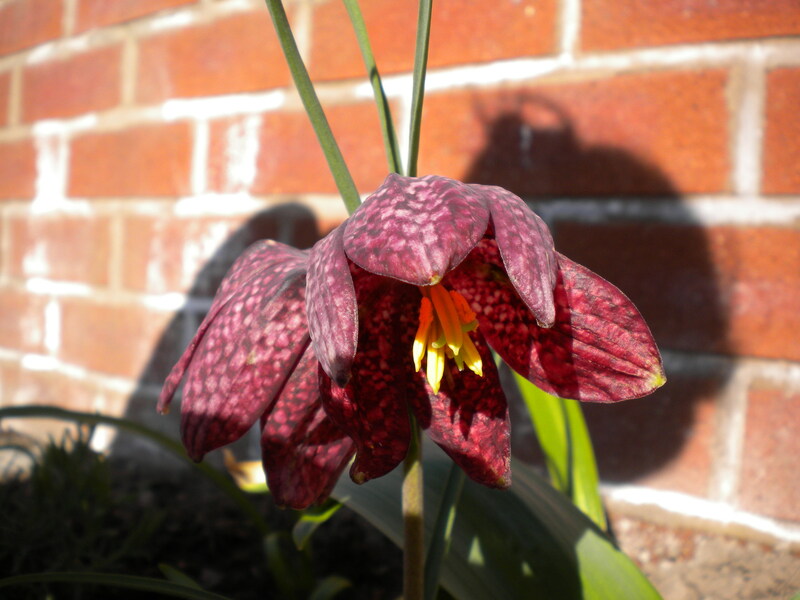 I had a grand total of 2 snowdrops come up but in the last couple of days I have 2 yellow fritillaries and this lovely one…..
A few weeks ago I received my 3 free* asparagus crowns, and am growing them in a patio bag which came with them. I keep having to top it up because this stubborn fellow keeps making a bid for freedom….. Although it is very tempting to cut it and eat it, I’m not allowed to have any for at least a couple of years! I’m am really going to have to learn some patience in this ‘grow your own’ game. This book is great for telling you what to sow, harvest and maintain in the vegetable garden for each month. If you like lots of colourful photos there are plenty here, in fact every page is full of them with the text mainly in boxes next to the pictures. But there are also full pages dedicated to a single type of veg and suggestions on good reliable varieties to grow. It’s a shame this has to go back to the library, it may be a book I will actually buy. 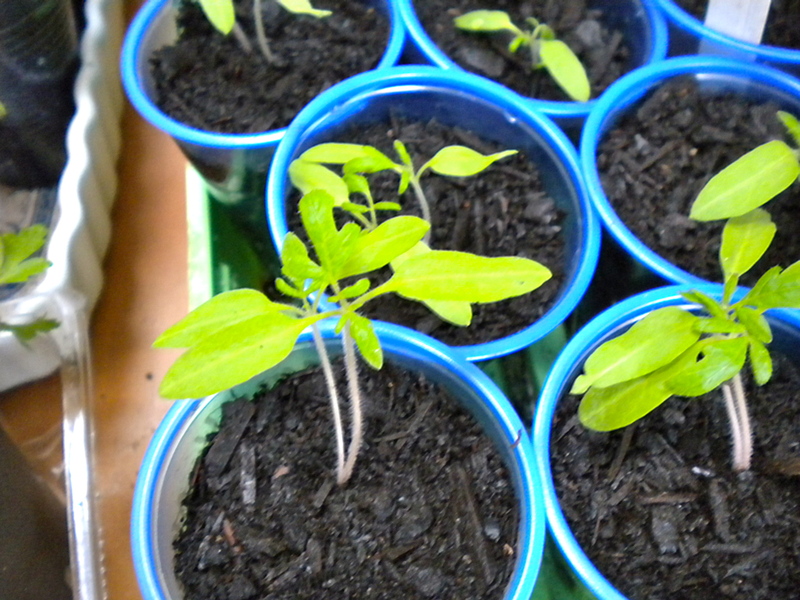 I tidied up the herb containers outside today, and then transferred the tomato seedlings into bigger pots. These are recycled cups from the water dispenser at work. This is a great guide to how to make compost for your garden. What to put in, what to leave out and how to keep it all healthy and rotting away. There is also a section for trouble shooting if your compost pile isn’t doing what it should. Ideal for beginners, but also helpful for those who already make their own compost but are maybe having some problems with it. Unfortunately this doesn’t seem to be available on Amazon at the moment. 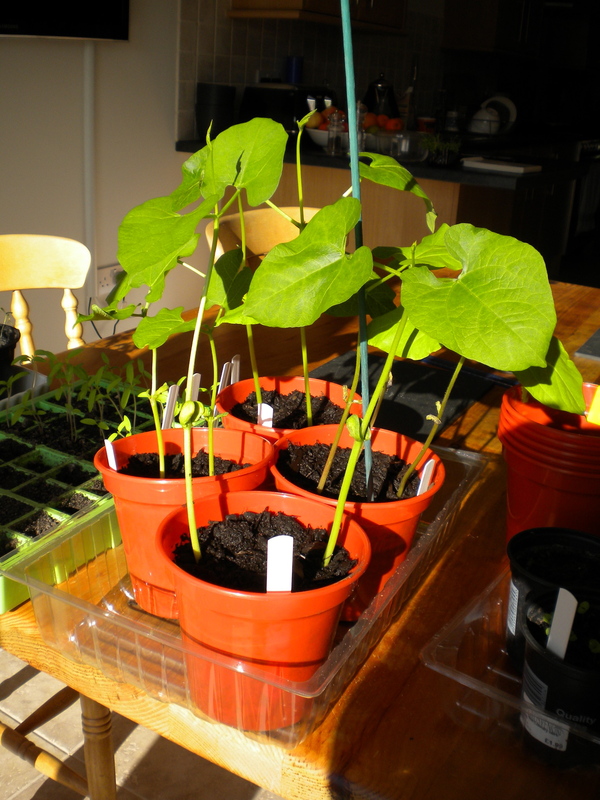 I’ve been seed sowing again this morning. 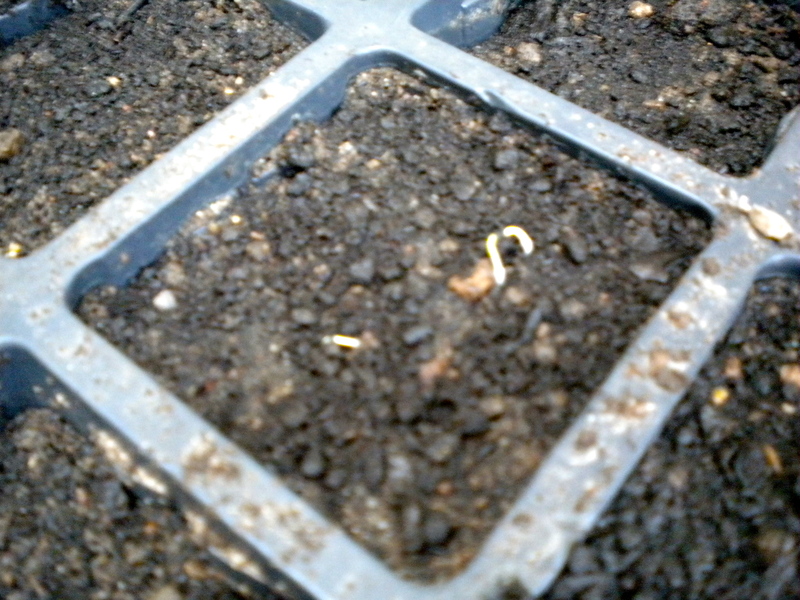 I put a row of beetroot in the veg bed outside and also re-sowed the peas. 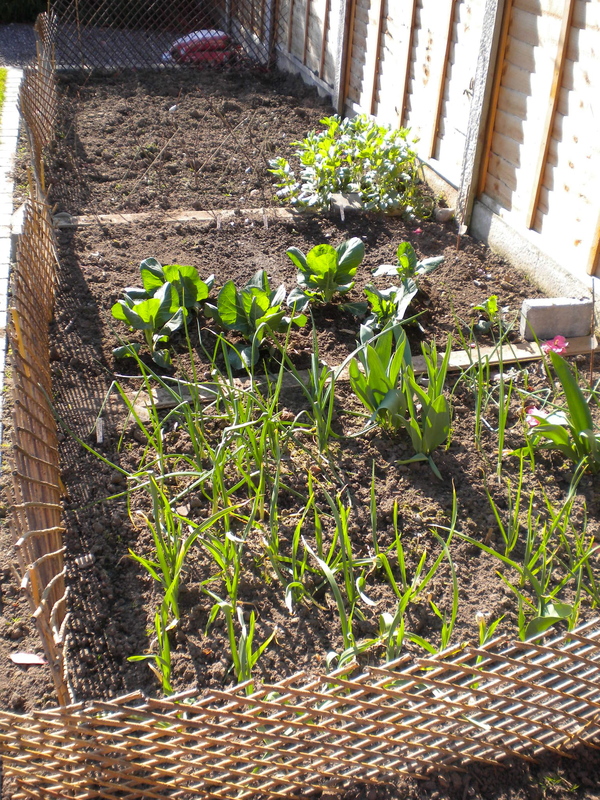 In seed trays I have done leeks, sweet peppers and Swiss chard. Hopefully these are in at the right times. 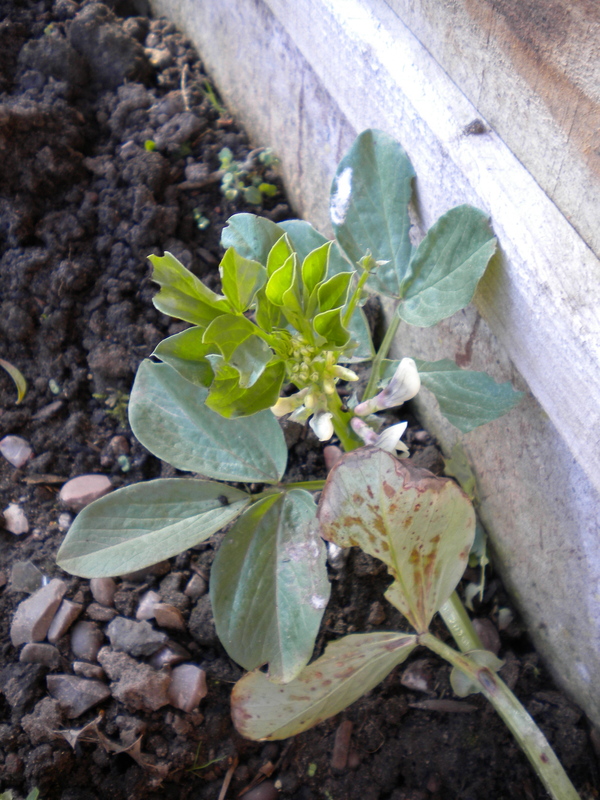 As for the beans they are now over a foot tall! Can anyone tell me when I need to plant my Dahlia roots? And if you are interested in what I have been sewing then you can have a look here!! Is there a giant at the top? 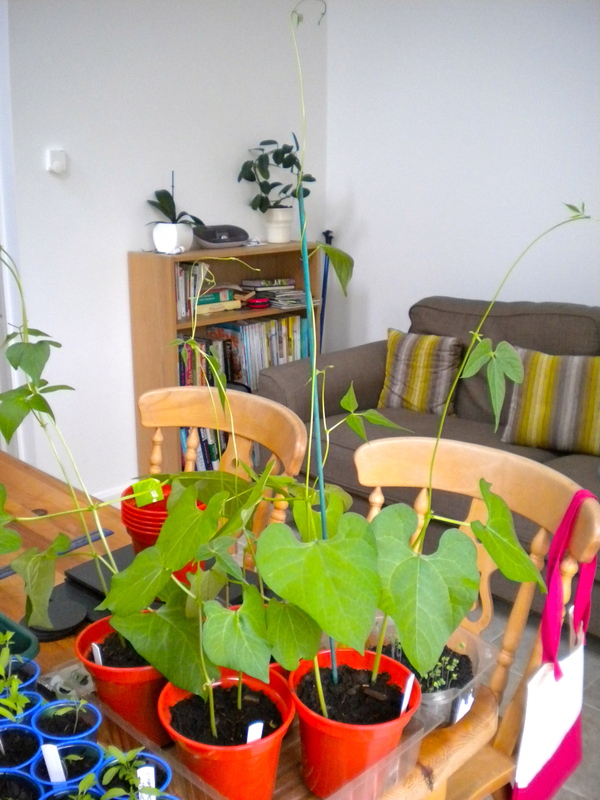 My beans are growing so fast I’m wondering if they are magic beans and there is going to be a giant at the top shouting ” Fee, fi, fo, fum!” Here they are as of this morning, 12 days after I sowed the seeds……. 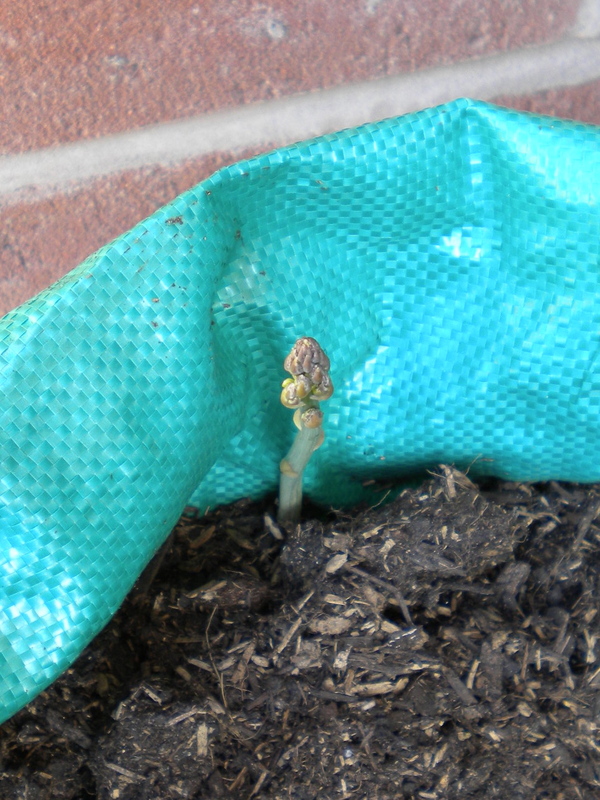 I bought some bamboo canes at the weekend, I think it might soon be time to construct some wigwams. Although saying that, there was a ground frost this morning so these are staying inside for now. 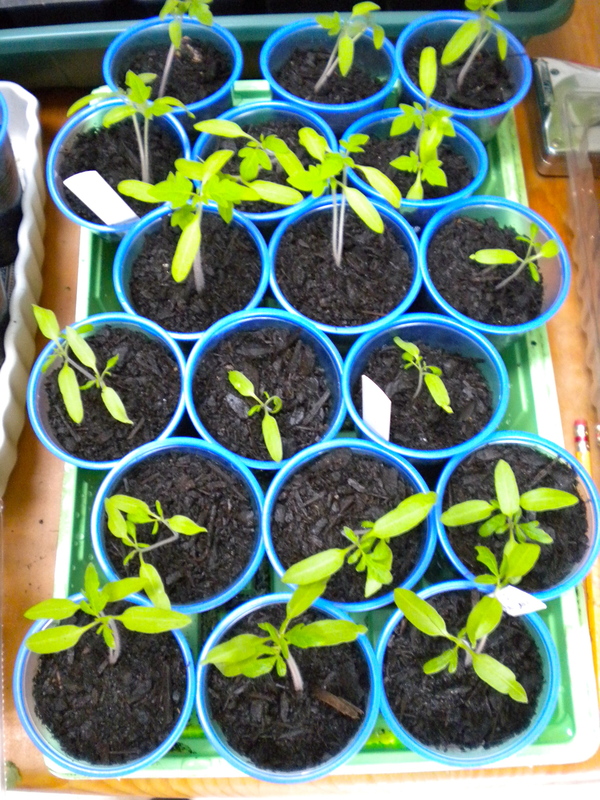 The tomatoes are slower growers but coming along with a germination rate of almost 100% (the beans have been 50%). 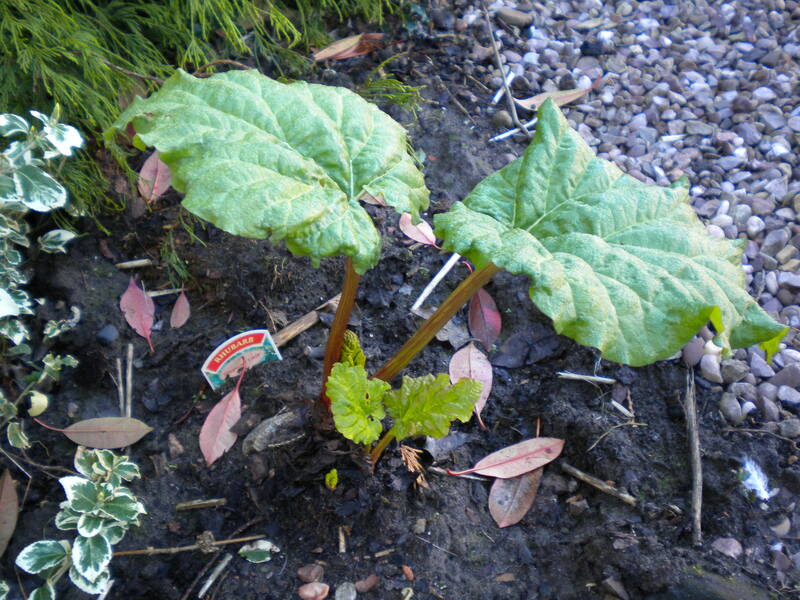 The rhubarb crown I planted in the autumn has two large stalks now and plenty of new growth. Would I be able to eat the two larger stalks or just leave the whole thing be until next year?